An initiative to establish Dublin as a Learning City, as defined by UNESCO, was launched today, by Lord Mayor of Dublin, Nial Ring. Supported by the Office of the Lord Mayor and Dublin City Council, the project is spearheaded by five universities and colleges across Dublin under the aegis of the Programme for Access to Higher Education (PATH), which is funded by Ireland’s Higher Education Authority (HEA).Dublin Learning City is led by Denise McMorrow, Student Experience Manager (IADT) and Trevor Purtill, Research & Development Programme Manager (MIE). In addition to announcing Dublin’s ambition to become a UNESCO Learning City, this event will also see 40 ‘1916 Leaders and Learners’ bursaries awarded to students from the cluster institutions. Supporting students for the full duration of their undergraduate programmes, these bursaries were made possible by funding from the HEA’s PATH programme. Led by the Leinster Pillar 1 cluster, this comprises University College Dublin (UCD), Trinity College Dublin (TCD), Dún Laoghaire Institute of Art, Design and Technology (IADT), Marino Institute of Education (MIE) and the National College of Art and Design (NCAD). In collaboration with Dublin City Council and other education and community stakeholders, Dublin Learning City will deliver and co-ordinate the programmes concept across Dublin city. This will include a week-long Learning Festival. The overarching aims of this initiative are to establish sustainable intergenerational learning communities in the city and to work towards developing a strategy to attain the award of UNESCO Learning City for Dublin. 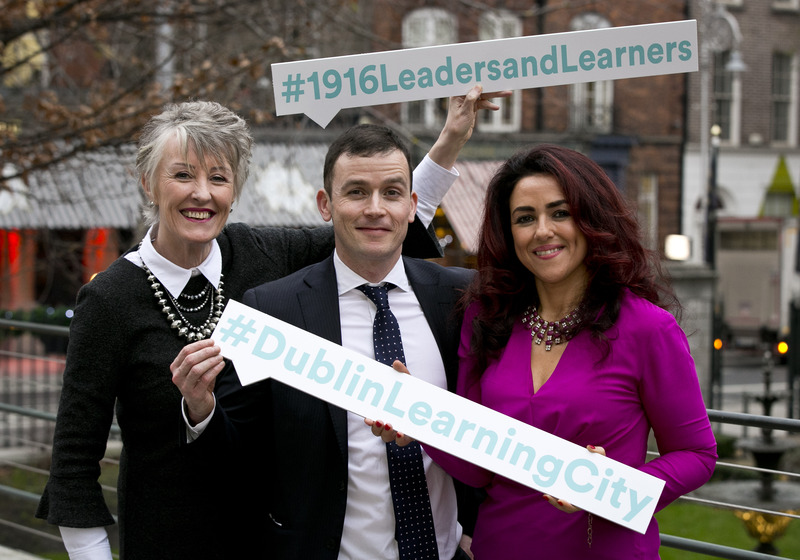 Dublin Learning City’s partners will amplify existing community education initiatives by using their city wide network and retaining an inclusive and inter-generational focus as a core operational tenet. In doing so, Dublin’s citizens will benefit from enhanced individual empowerment, employability and social inclusion, economic development, cultural prosperity, and sustainable development. The aim of the Dublin Learning City initiative is to ensure that education and learning is accessible for all inhabitants, regardless of age, and in traditional and non-traditional settings. Dublin Learning City: Enabling, Fostering, Exploring and Celebrating Everyday Conversations about Learning and Opportunities for Dublin’s Citizens. 60 Grand Canal Street Upper, Dublin 4.